Interested in diversity in athletic training? Join the conversation. The NATA Ethnic Diversity Advisory Committee (EDAC) serves in an advisory capacity to the NATA Board of Directors, aiming to identify and address issues relevant to the ethnically diverse populations to better serve the needs of our patients, as well as members of the profession. EDAC advocates sensitivity toward cultural diversity, development of cultural competence within the profession and promotion of athletic trainers as leaders in issues related to cultural competence and professional diversity within the health care professions. EDAC members are selected to represent each NATA district and are appointed to the committee by the district director and the committee chair. Contact the committee. Join EDAC on Twitter, Facebook and Instagram! EDAC hosts many events at the NATA convention for those interested in diversity within the athletic training profession including an educational session and a town hall meeting. It was a very busy week for EDAC in New Orleans! The committee kicked off the week by collaborating with NATA's At Your Own Risk initiative to host a sports medicine camp for local youth at the Ochsner Sports Performance Center, the practice facility for the New Orleans Saints. More than 70 EDAC volunteers taught the campers about sports medicine as they rotated through hands-on stations and learned about the athletic training profession. All campers went home with an informational pack about sports medicine injuries that included information on how to become an athletic trainer and how to reach out to EDAC for direct mentorship. Later in the week, the committee hosted its annual Career Day event for diverse college students. Speakers included Frank Walkers, PHD, ATC, LAT, Erin Hassler, DAT, MS, ATC, LAT, Marsha Grant-Ford, PHD, ATC, LAT, and Duane Brooks, MS, ATC. The event is designed to make it easier for collegiate athletic training students to connect with established mentors as they begin their careers. EDAC's annual educational session, "Mentoring: We Rise by Lifting Others," was very well attended. Stephanie Mazzerolle, PhD, ATC, and Frank Walters, PhD, ATC, LAT, discussed effective strategies for mentors and mentees. The event was moderated by Cynthia Marra, MS, LAT, OTC. Lastly, the committee's culminating event, the EDAC Town Hall & Social, was a packed house! Approximately 300 attendees were on hand as the committee honored Scottie Patton, MS, ATC, head athletic trainer for the New Orleans Saints, with the EDAC Bill Chisolm Professional Service Award. Former EDAC chair Rene Revis Shingles, PhD, AT, ATC, received a standing ovation in honor of becoming the first black woman inducted into the NATA Hall of Fame. 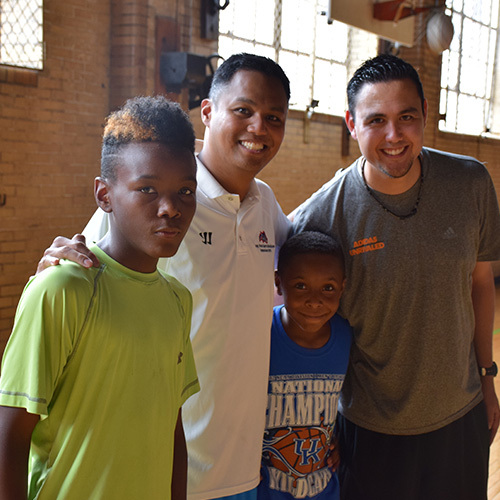 Watch the following video to see highlights from the Prepare to Play sports medicine camp hosted by EDAC. Prepare to Play: A Sports Medicine & Wellness Camp from National Athletic Trainers' Assn on Vimeo.